This is about me getting a substantial amount of grey hair over the past couple of days, trying to hunt down a setting that would cause the current version of Xcode 4 to build my iOS projects to an unexpected, but not unfamiliar, taken over from Xcode 3, location, but not presenting any obvious way to revert that. 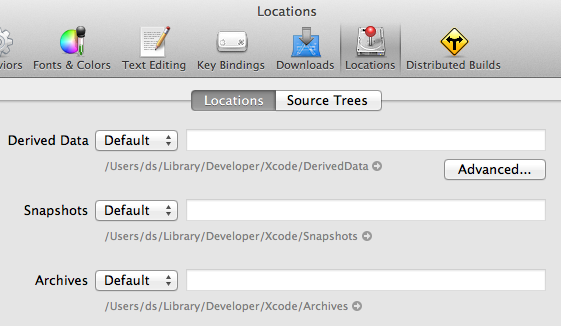 In Xcode3 you could use the preferences dialog to configure custom build output folders. This was necessary when you wanted to organize a somewhat more complex software into several cross-referencing Xcode projects and at the same time retain some sanity when linking and packaging it. Clint Harris Tutorial on shared libraries describes it in more detail. 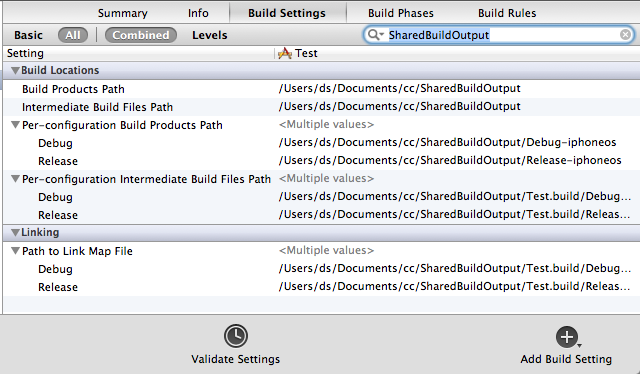 In my venerable Xcode 3 setup I configured the shared build output to /Users/ds/Documents/cc/SharedBuildOutput. As you can see, there is no trace of the previously configured shared build output setting, let alone my custom directory. Ok, so apparently this is the new way of doing things, and starting with new projects will surely apply. This clearly goes against the current Xcode standard of placing build products into so-called “Derived Data” subfolder folders with (partly) random names. Build scripts can use these by referring to them using the environment variables, but more often than not, leaving the (now already) trodden path of the new defaults will cause more trouble than it’s usually worth. “How do I fix this?”, you might ask. Well, that’s what I asked myself, too, and it took me a few days to finally figure it out. Remember that Xcode 4 no longer shows this path in its Build Locations preferences, so this is obviously not getting us any further. Changing the folder at the project level works, overriding the default. As soon as you have created a new project, you can change the “Build projects path” and “Intermediate Build Files Path” to simply build. 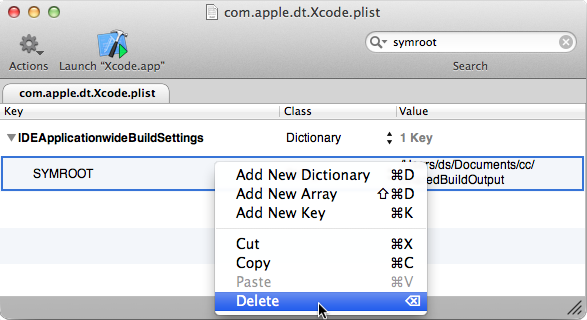 This should be the same value that’s the default in a fresh Xcode 4 installation. However, that, too, requires you to remember making the change for each and every new project. Surely it would be better to get rid of that now-unwanted setup. Instead of removing these two lines and converting the file back to its binary format, I deleted that entry with the handy little PrefSetter application by navigating to the com.apple.dt.Xcode domain and searching for SYMROOT in there. That way there is no risk of making any typos, damaging the file. Do not forget to save the change!